If you have been in Paris at the beginning of Spring, you will remember the excitement of everyone taking their first apéro or espresso of the season on a cafe terrace. Restaurants all over France take their menus outside when the “beaux jours” (beautiful days) have arrived, and patrons leisurely savor their meal on patios adorned with fresh flowers of the new season. 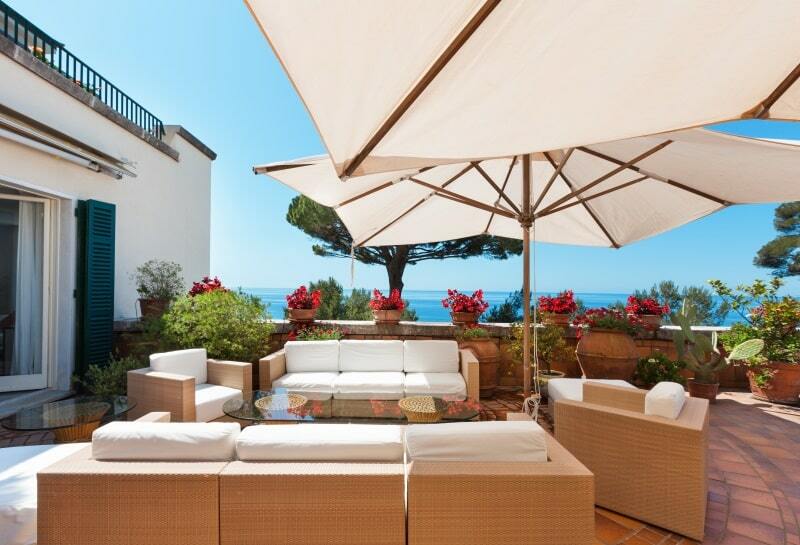 The great news is that the pleasure of the cafe terrace or restaurant patio can also be enjoyed at home with a well-designed patio. There is nothing like taking your life outside when you’ve been cooped up inside most of the winter. Regardless of your budget and the type of weather you live in, being able to enjoy fresh air with the sun, or the moon, keeping you company is a treat. 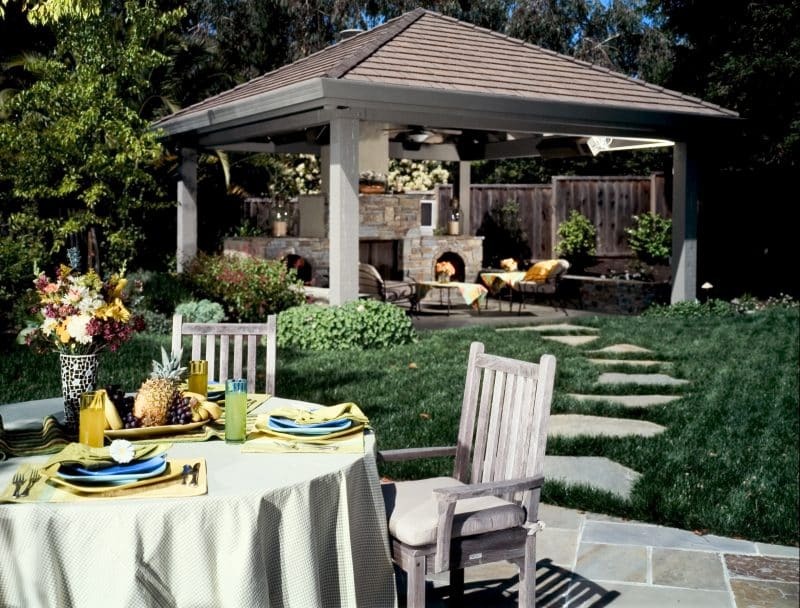 Whether you’re enjoying your morning breakfast, getting lost in a good book or savoring a light lunch or evening dinner, your patio is just like any other room in your house and should make you feel happy and refreshed. Over the years we’ve gathered ideas from our travels and also browsed through many beautiful patio designs (you know how much we love pics!) so we could bring that feeling right here in our home in the US and make it part of our daily lives…weather permitting of course! 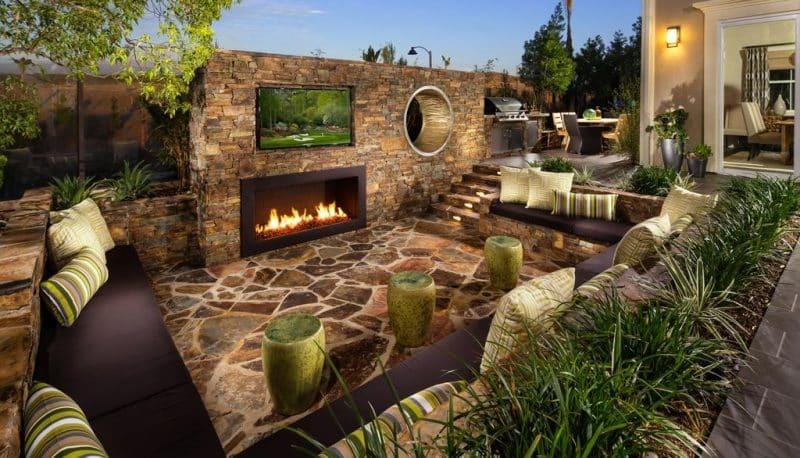 So we’ve selected these breathtaking backyard patio designs which we hope will inspire you to bring an uplifting and relaxing patio experience right here in your own home. Enjoy and beautiful day to you! 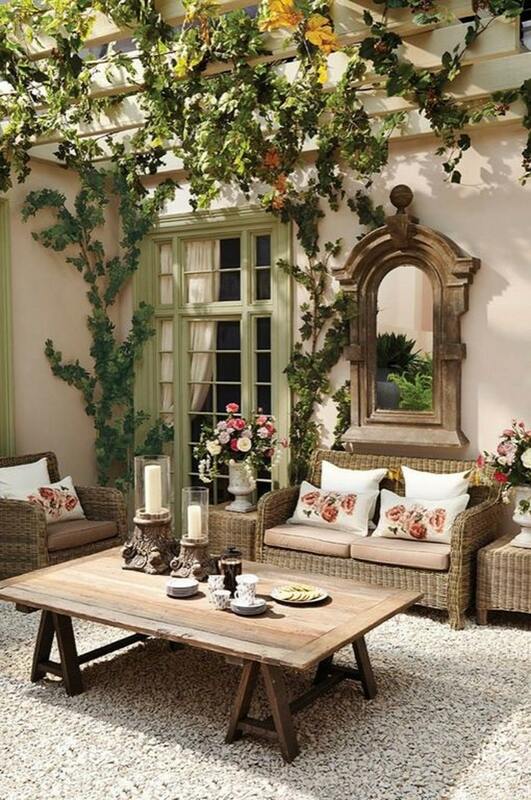 The Little Plus: the patio with stucco columns and wooden pergola. 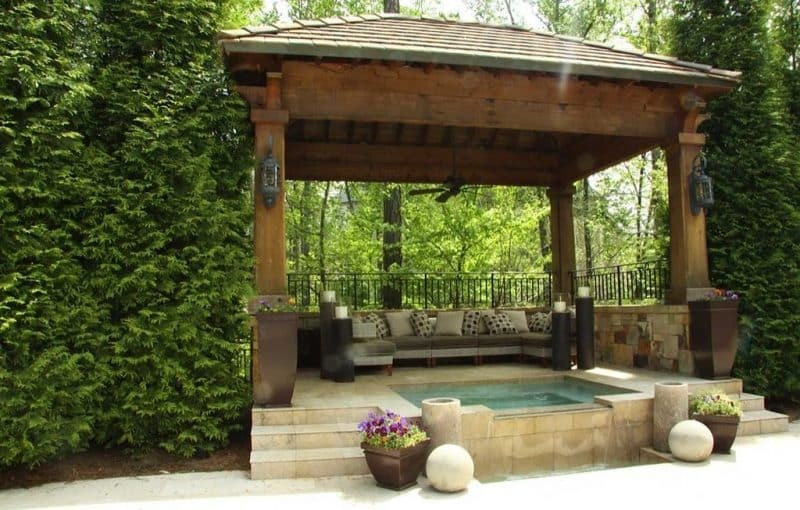 By defining this area with comfortable seating, proper lighting and planters, the pergola creates an outdoor room — a great spot for entertaining. And on a chilly night, you can even enjoy a cozy fireplace! 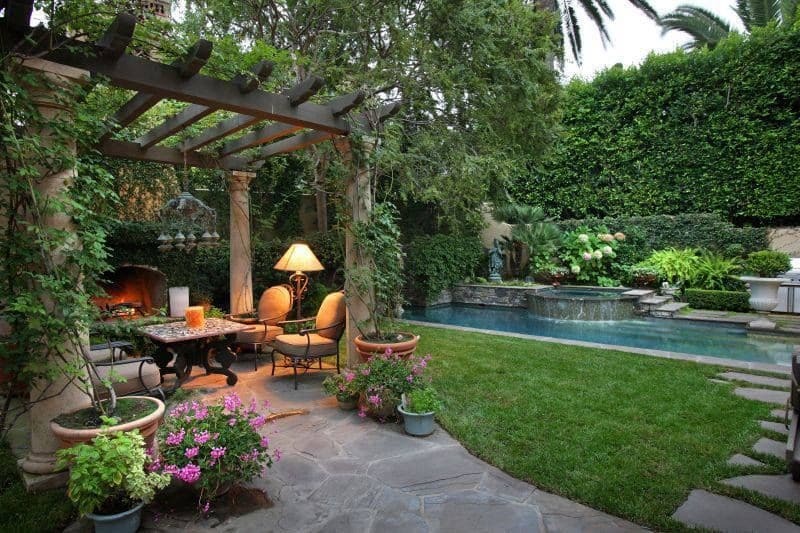 And notice the pool and hot tub…the exclamation points to this relaxing backyard retreat oasis. The Little Plus: the attached pergola that functions as a spillover area houses attractive features such as the Gothic-style antique mirror. Looking like it’s been salvaged from the ruins of an abbey or church, this conversation piece has the properties of solid stone and a textured time-worn patina. Light colored loose pebble stone used to cover the patio area provides contrasting textures and meshes well with the neutral color palette of the home. And that farm-style coffee table handmade from salvaged wood — so country charming! The Little Plus: the Saltillo tiles steal the show. 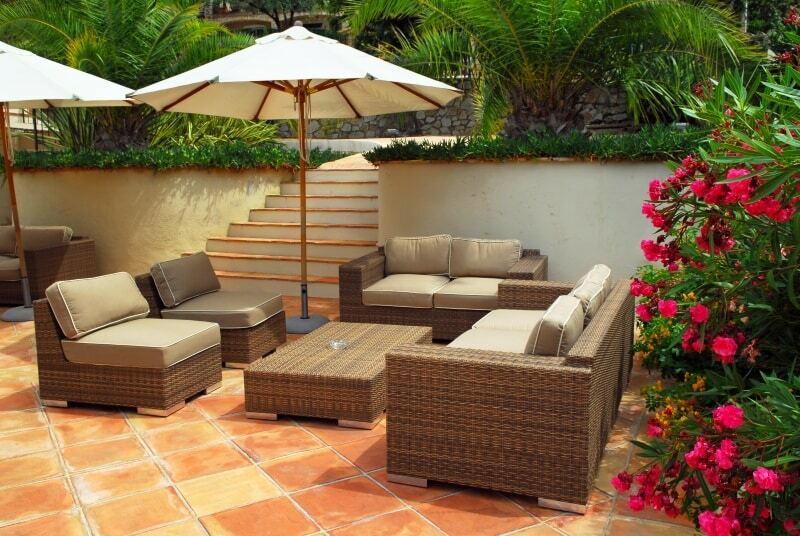 The earth tone rattan outdoor sofa and coffee table are a good choice to contrast with the yellow and terracotta hues of the patio flooring. 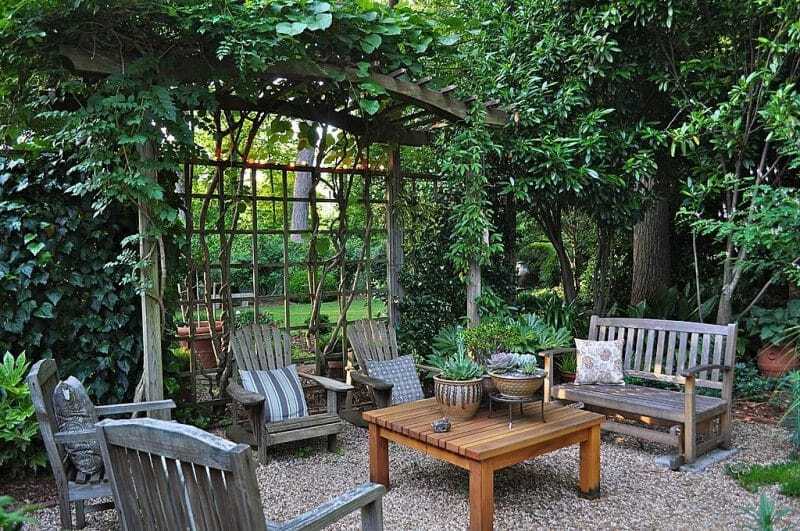 The Little Plus: the arbor and trellis with its vertical beauty are not only a practical place to train plant vines and crawlers, but it also defines the space as a rustic outdoor retreat. As for the flooring, the drain rocks offer a natural and budget-friendly canvas for this little piece of outdoor heaven. Inspiring us are the re-purposed wood chairs and rocking bench adorned with cushions upholstered in fabric calling the natural color palette. Finally, notice how the three succulents in ceramic vases are arranged to form a beautiful centerpiece. Afternoon tea? Or maybe coffee with friends? The Little Plus: the terracotta tiles with a circular pattern. Also, note the cleverly hidden watering system to keep your patio planters happy! And did you notice that potted miniature lemon tree — lovely! The Little Plus: the cabana with its U-shaped sofa — ensconce yourself in the plush cushions and pillows with the feel of cool marble flooring under your toes and sharing a glass of Veuve Cliquot with the love of your life. Also, notice the wide variation of hues of the cabana stone walls. It very nicely ties the colors of the floor and wood structure of the cabana together. And how about the hot tub? It is so inviting with its aqua water…you just want to kick off your shoes and step in! The Little Plus: the recessed patio with flagstone and built-in seating is all about outdoor comfort. From wraparound cushions to ceramic footstools, all amenities are complete in this well-thought-out layout. Planters on the retaining wall keep the greenery in order, and the recessed LED step lights guide you into this space — hidden during the day and add to the ambiance at night. And to soften the angles of the clean lines around, notice the circular peek-a-boo accent on the wall.